Science: with added ghosts, UFOs… and plant pots! How much science can you do with three plant pots, two metal rods and a bottle of water? 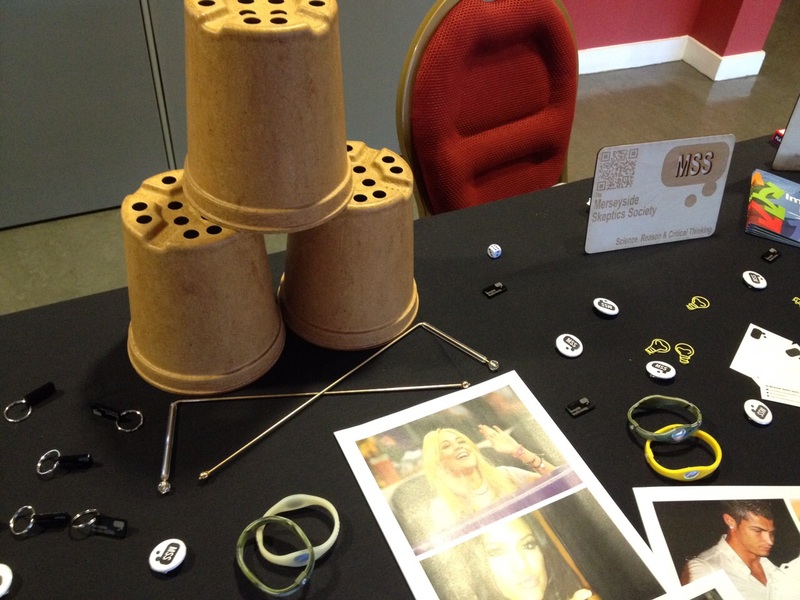 The answer might surprise you – as the children at the Big Bang North West 2014 found out! The experiment was just one of a number of simple, hands-on demonstrations that myself and my colleagues from the Merseyside Skeptics Society brought to the exhibition to showcase ways in which our brain can play tricks on us, and how the scientific method can be used to prevent us from being fooled… or from fooling ourselves. So, why the plant pots? The answer lies in the ancient art of dowsing: the ability to locate water using just a pair of metal rods, and a heavy helping of pseudoscience. Bringing along our very own dowsing apparatus – bent metal rods which swing freely back and forth when held with a light touch – we demonstrated to the children how some people believe the movement of the rods can indicate the location of water. At this point, it was the children’s opportunity to try dowsing to locate the bottled water on the centre of our desk. After a little practice, hey presto!, everyone successfully managed to get the free-wheeling rods to point to the water, thus seemingly confirming the work of many generations of dowsers in tracking water in deserts, water mains on construction sites and (troublingly) explosives in Iraq. Except, of course, this was not the end of the demonstration: our next question to the students was to ask whether we should take the result as proof that dowsing really works, or if there were any ways to test whether there’s some other explanation for the seeming success. After a little encouragement, without fail one of the students asked what would happen if we hid the water… which is where the plant pots came in. Taking the student dowser aside while the other students hid the water in one of three plant pots on the table, the experiment could be repeated with sufficient blinding. Lo and behold, the success rate dropped to around one in three – consistent with chance. It served as a perfect demonstration of the mind’s ability to fool itself, where prior knowledge of the location of the water gave subtle hints which unconsciously influenced the movement of the rods. Without pausing to question whether an effect might be erroneous, people for centuries have fooled themselves into believing dowsing was effective, but our students were able to quickly design an excellent experiment to really reveal what was actually going on. Did you see the spirit of a leaping child? Or, like many of our students when asked to set aside assumptions and spook stories and really examine the evidence, did you see an extreme close-up of a spider crawling on the lens of a CCTV camera? It was another lesson in the brain’s ability to fool itself, reading more into otherwise innocuous visuals and situations when primed to expect something unusual. Of course, it’s not always our brain that’s out fool us, and our final experiment of the day focused on some of the techniques that can be used to fool others, with a particular focus on sports performance wristbands – a major fad from recent years, endorsed by celebrities like David Beckham, Cristiano Ronaldo and the England Cricket Team. Our team had some sports wristbands of our own, and took students through the various demonstrations used to prove their effectiveness – showing that wearers of the band have improved flexibility, balance and strength, compared to their performance without the band. With bands retailing for as much as £70 (including the Shuzi band, who’s product we at the Merseyside Skeptics Society have reviewed and tested in the past), it would be easy to think their claims were based on sound science. However, the performance of such products in tests and demonstrations is based entirely on the fact that those giving the test know when the subject is or isn’t wearing a band, and thus the subjective test is highly prone to manipulation and bias. When presented with the facts, students were quick to suggests ways to design a fair test by removing the subjectivity, blinding the tester or replacing them with an unbiased, impartial tester – all signs of excellent scientific thinking! Using examples of pseudoscience can be a great way to teach the scientific method, to help demonstrate that scientific principles aren’t only good for classrooms and laboratories, but can help uncover the mystery behind spooky phenomena and see through the claims of the latest celebrity fad, as well as learning that every single one us can be mistaken. We were very impressed with the energy and enthusiasm of the students at Big Bang North West, and at their ability to pick their way through our demonstrations to design fair and effective ways at telling what really works and what doesn’t. And hopefully we might have encouraged the next generation of skeptical minds! Sounds like the Merseyside Skeptics had a ball at the Big Bang North West 2014 doesn’t it? Keep your eyes peeled on Twitter and Facebook to see if they’re heading back to Aintree to join us again this year. 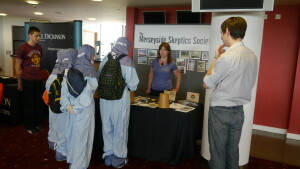 Our visitors just loved their stand! 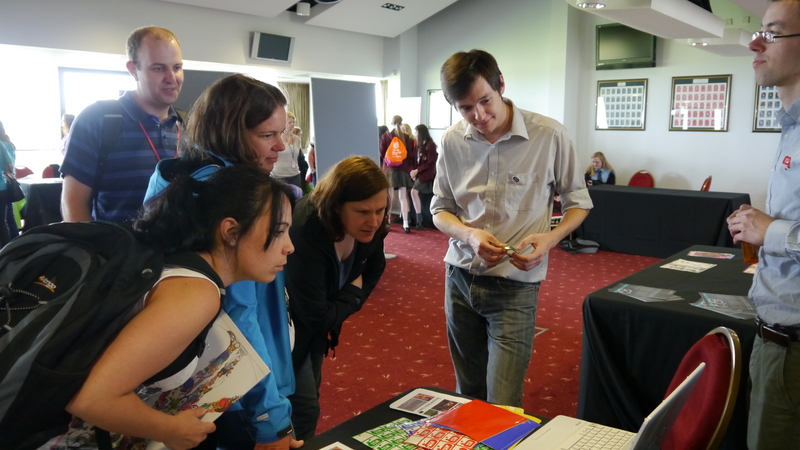 THE BIG BANG NORTH WEST 2015 IS COMING – BOOK NOW!